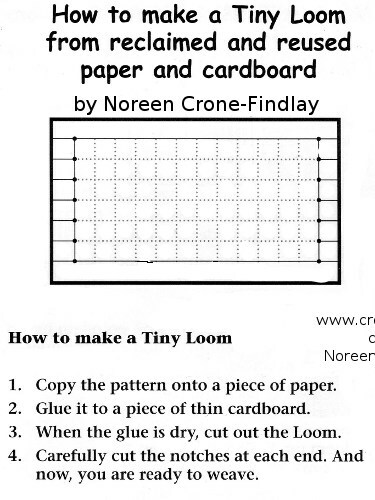 ← When should a child start learning how to weave? One of the pleasures of weaving is that it can be done with tremendously complex machines, but, can also be done with small bits of this and that from around the house. Today and tomorrow, I am going to be posting little how to’s on making recycled and upcycled looms that are great for teaching kids how to weave, or just for noodling about with sampling yarns and weaving little bags, or hacky sacks or bookmarks…. If you make each grid square 1/4 inch, then the loom is business card size, which is a charming size to work with, and to pop into a pocket or bag. 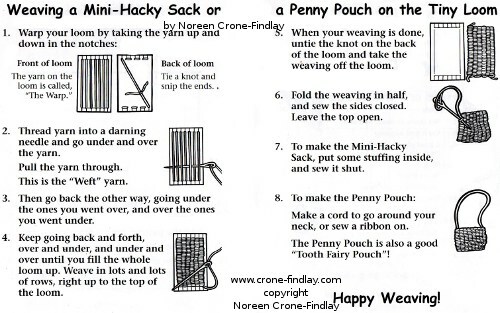 If you weave 2 tiny rectangles on the loom, and stitch them together, then add a beaded fringe, it makes a very pleasing little amulet bag. What a brilliant and earth-friendly project this is! I can just see all these little kids sitting around their new looms, creating their little bags!